We believe trees and gardens are a vital part of our environment, and our approach to their management is sensitive to both our clients, and their trees’ requirements. We endeavour to provide the best solution for our clients, whilst maintaining a natural, artistic and ecologically considered approach to our work. Our clients’ gardens are often their pride and joy, and we strive to minimize disruption throughout our operations. Plants, garden landscaping and wildlife are protected from any damage, and sites are left clear of all debris and tidy. When removing waste through houses, care is taken to cause no damage and keep mess to a minimum. The concerns of neighbours are also understood and respected. 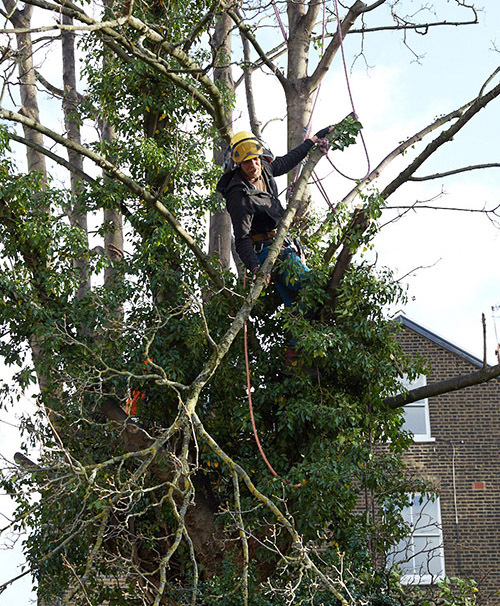 Do you need a tree surgeon in N16, Stoke Newington, Islington, Camden, Holloway, Finsbury Park, Hampstead, Stratford or the wider area? We are ideally placed for all your tree pruning needs, including crown reduction, crown thinning, crown lifting and pollarding. Burnwell Trees provide high quality tree care, enabling appreciation of the trees around us. Contact us now for sensible advice, friendly service and a great deal.